Christian Pulisic (c.) scored Borussia Dortmund's opening goal against Bayern Munich in the 2017 DFL Supercup. If there is one man who could scupper Bayern Munich's plans in Saturday's Klassiker at the Signal Iduna Park, it's Borussia Dortmund star Christian Pulisic, who was already his side's best player when the two rivals met in the DFL Supercup back in August. Football can be a cruel game, as 19-year-old Pulisic has discovered over the past few weeks. At the start of October, Dortmund were sitting pretty at the top of the Bundesliga - five points clear of Bayern - and the United States looked nailed on for a place at the 2018 FIFA World Cup after Pulisic inspired them to a 4-0 win over Panama with a goal and an assist. Fast forward three weeks and the landscape is rather different. Four days after that Panama victory, the USMNT were stunned by Trinidad and Tobago - in spite of another Pulisic goal - putting an end to the BVB starlet's dream of featuring in Russia next summer. When the Bundesliga resumed, Dortmund only managed to pick up a point in three outings, allowing a revitalised Bayern to move into top spot ahead of the season's first Bundesliga Klassiker. "After we had that amazing start, with I don't know how many wins and no goals conceded - I mean, it's hard to expect that the whole season," Pulisic told bundesliga.com. "There are going to be tough times, and right now is a tough time - but I believe in our team and I think we can bounce right back." And what better occasion to bounce back than against Bayern, at the Signal Iduna Park, with top spot in the Bundesliga on the line? "The Klassiker definitely has that special feeling," the Dortmund No.22 added. "When we play against Bayern, one of our main rivals, the game always has a bit of extra meaning to it, and you want a good result." After a run of three games without victory - a 3-2 loss to RB Leipzig, a 2-2 draw with Eintracht Frankfurt and a 4-2 defeat at promoted Hannover - Dortmund are determined to get back on track against the reigning five-time champions. And Pulisic, who seriously impressed in the Supercup, may be just the man to unlock a Bayern defence that has only conceded one goal since Jupp Heynckes returned to the helm. The American needed just 12 minutes to give the Black-and-Yellows the lead in the season's curtain-raiser, picking Javi Martinez's pocket high up the pitch and stroking the ball confidently past Sven Ulreich. Although Bayern went on to triumph on penalties after the game finished 2-2, Pulisic put in an eye-catching performance for Dortmund, and his turn of pace and sharp passing will be a valuable asset against the formidable central defensive partnership of Mats Hummels and Jerome Boateng. 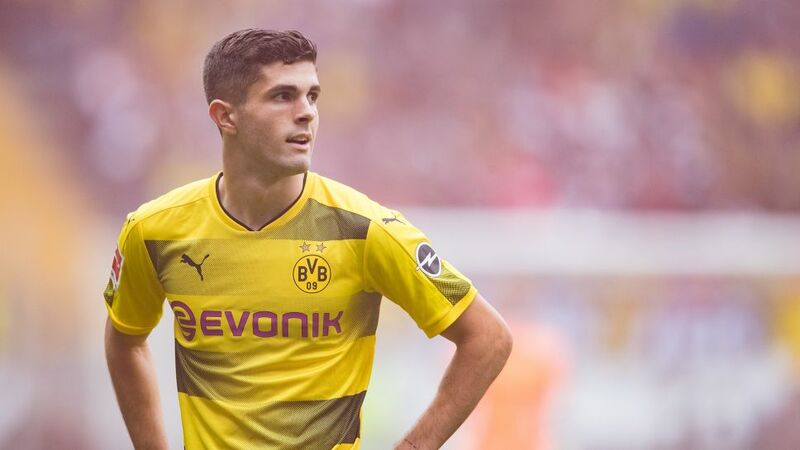 Often used as a substitute by Thomas Tuchel last season - making 14 of his 29 Bundesliga appearances from the bench - Pulisic has emerged as a key component in the Dortmund machine under Peter Bosz, and he has been named in the Dutchman's starting XI for eight of the 10 games this term. As well as scoring in the Supercup, the talented young winger has netted twice in the league, in the 3-0 wins over Wolfsburg and Hamburg. The 19-year-old has already proven that he can make a difference in the big games, and they don't come much bigger than Der Klassiker. So far in his four meetings with Bayern, Pulisic has won two and lost two, and he will be determined to tip the scales back into his favour on Saturday. Football can be cruel, yes, but it can also be magnificent, and inspiring Dortmund to victory over the champions in front of 80,000 screaming fans would live long in the memory.